After completely failing to deliver a post last week I am finally back up with a new post in the travel photos series. I have been extremely busy with work and other activities but that should not be an excuse if I want this to be a successful blog. Hopefully, I can deliver one more post this afternoon. 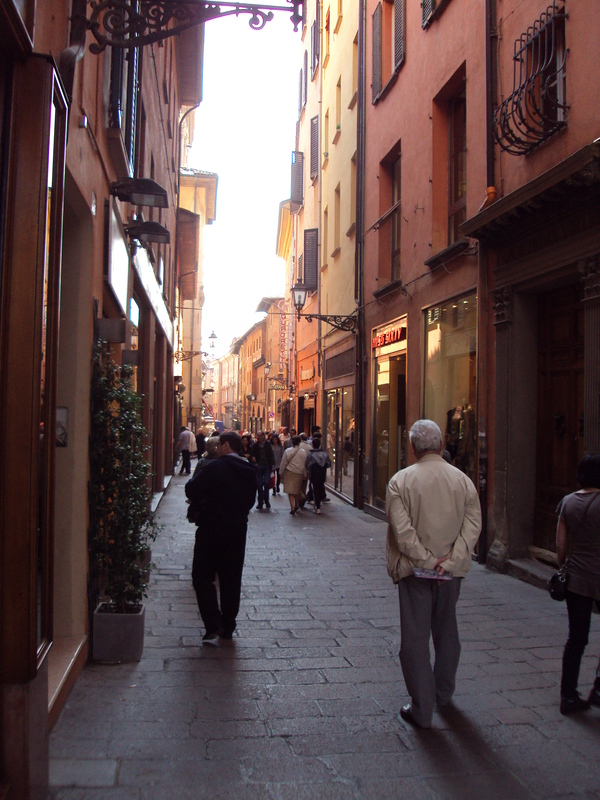 In the meantime, here are some photos from one of my favorite cities in the world – Florence, Italy. Enjoy! The first photo in this series is a view from the Piazzale Michelangelo above the beautiful city of Florence (well worth the hike up the hill). 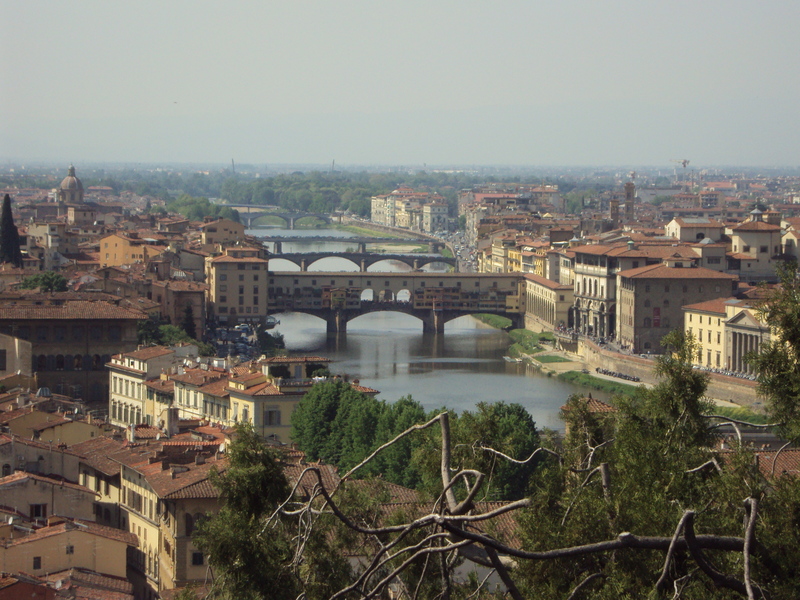 This picture shows the bridges in the old town crossing the River Arno. The bridge most in focus is the Ponte Vecchio. 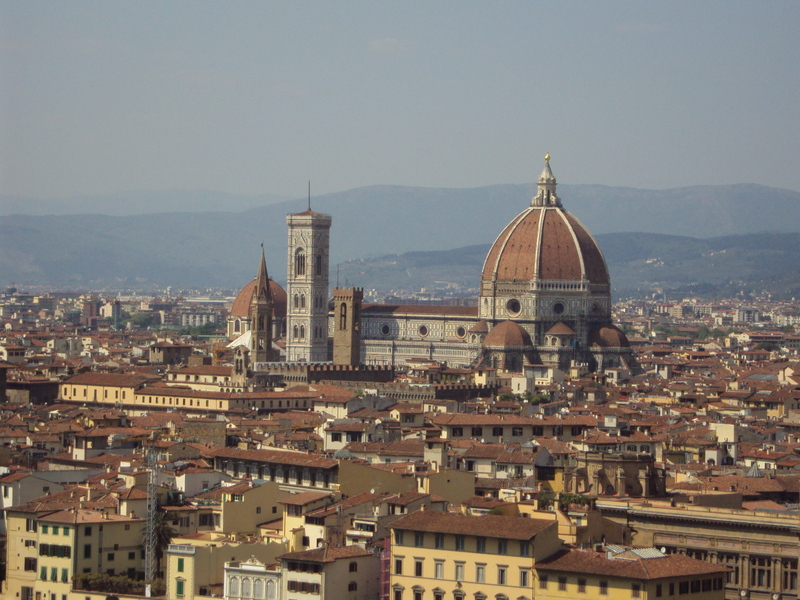 This photo was also taken from Piazzale Michelangelo looking out over Florence. 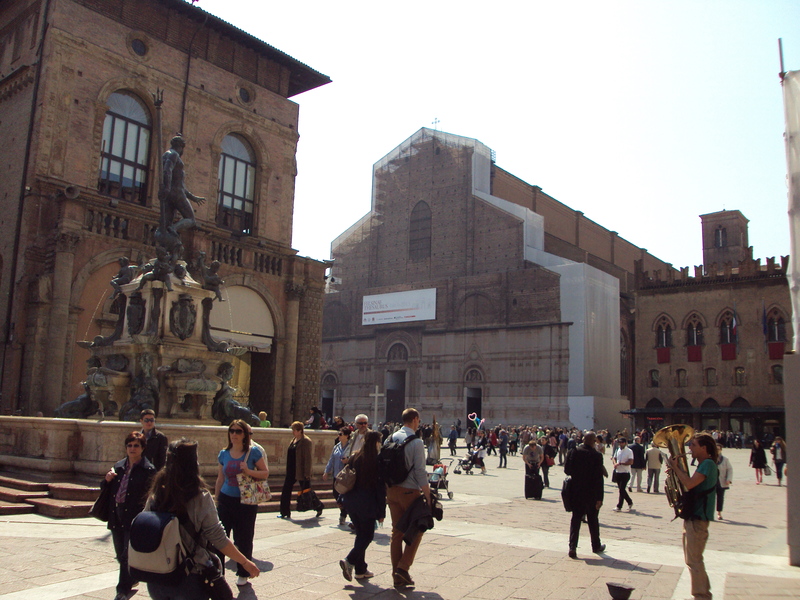 The Duomo is centered in this photo and the immense size, when compared to the other nearby structures, really stands out. One of the things I would recommend when traveling through Florence is to make sure and visit the bridge to the west of the Ponte Vecchio as the sun sets. The views of the city and the Ponte Vecchio, specifically, are spectacular at this time. 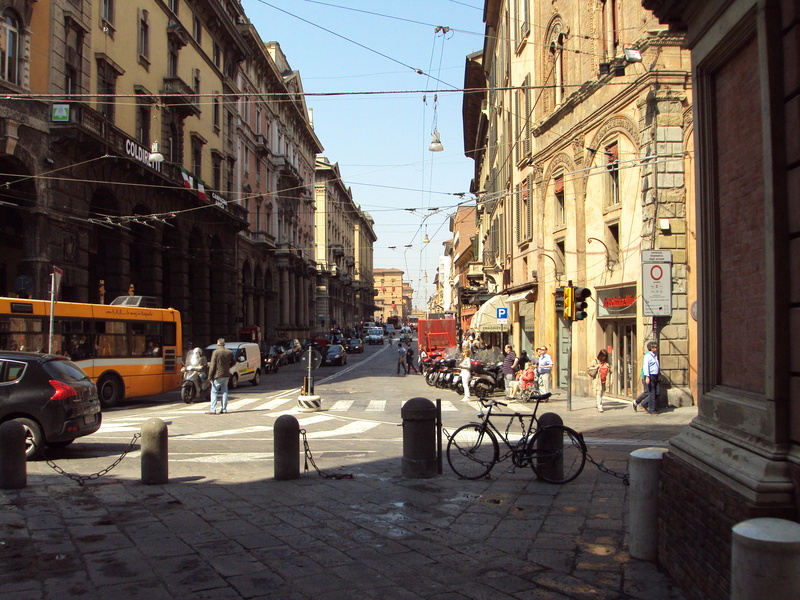 This photo was taken on our first day in town after a long day of travel from New Orleans to Florence. 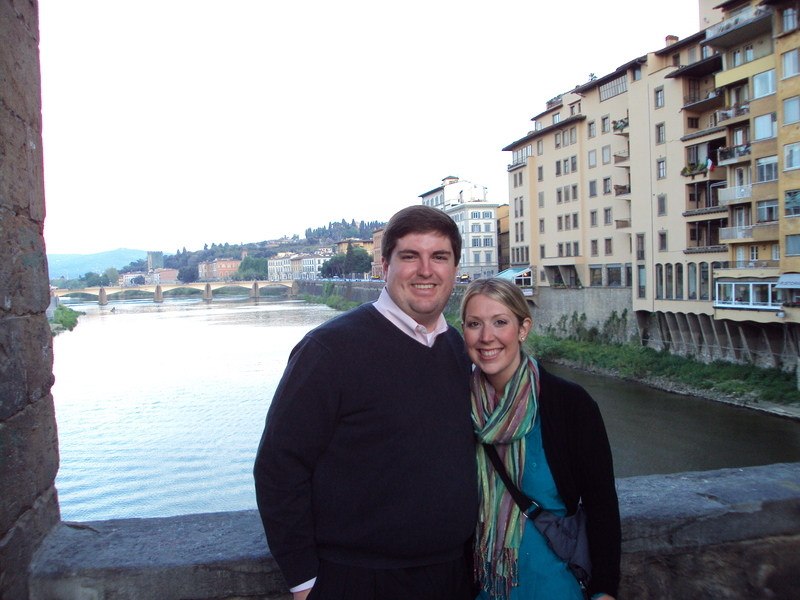 Did I mention this trip to Florence was for our honeymoon? I guess I would be remiss if I did not include one picture of myself and my wife. 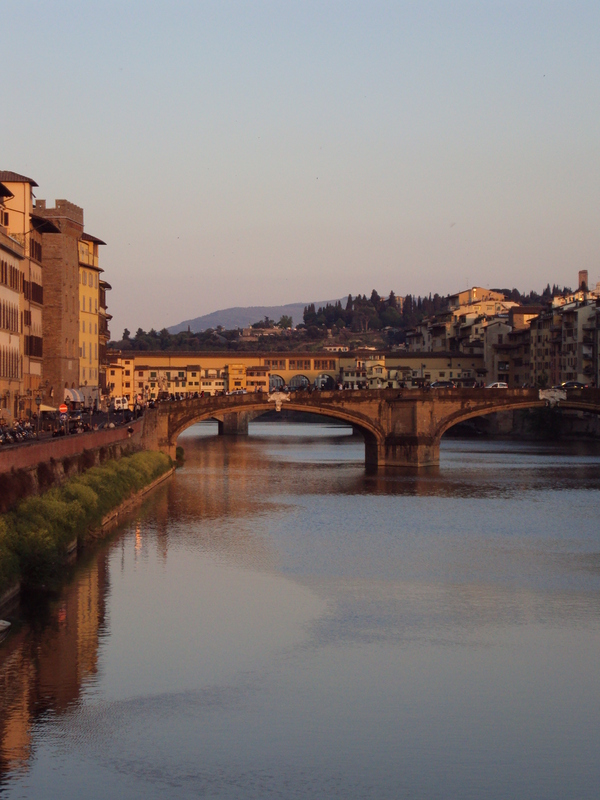 This was taken on the Ponte Vecchio looking to the east. This next photo is of the view from our room overlooking the Piazza Santa Mario Novella. It was such a beautiful view to wake up to each morning. We stayed at the Hotel Santa Maria Novella for 4 nights and I would highly recommend the hotel to any potential travelers. It is not the best for budget sensitive travelers but it is worth the splurge due to the location and quality of rooms. 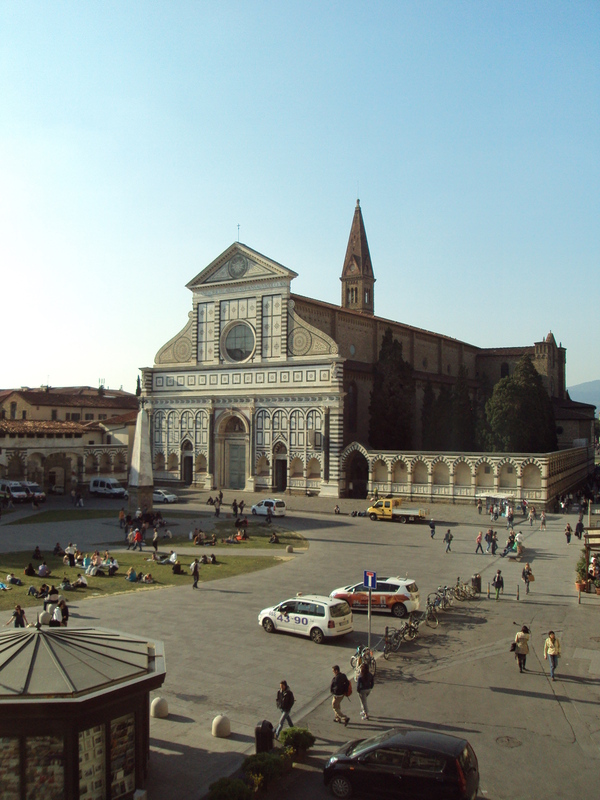 It is about a 5 minute walk from the Santa Maria Novella train station (very easy even with large suitcases). 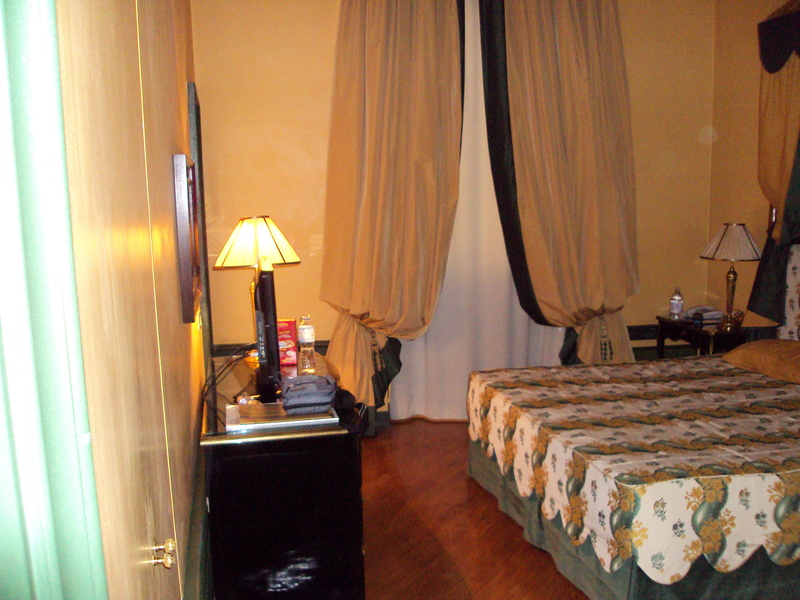 A photo of the interior of our room at the Hotel Santa Maria Novella. 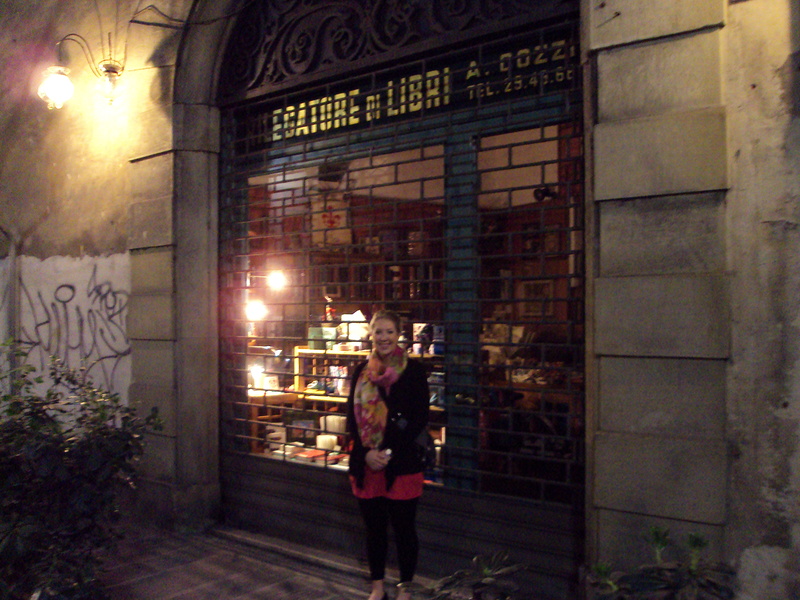 This last photo is of a neat, boutique bookstore that we found on a side street in the heart of Florence (my wife is standing in front). We bought a leather-bound photo album with our last name stamped onto the spine manually. The man who stamped the book for us did it completely by hand, without the aid of a straightedge, and made it look beautiful. It was not cheap but I would recommend it to anyone looking to have a lasting memory of Florence made with beautiful craftmanship (~60 euro). I hope you enjoyed this series and as I mentioned above I hope to post one more entry this afternoon. Wish me luck! I have not been able to do any substantive work on posts this week but thought I would share some photos from Bologna, Italy. It is not one of my favorites that I have visited but it was unique. I enjoyed the town, but given the choice I probably would not return. Enjoy! 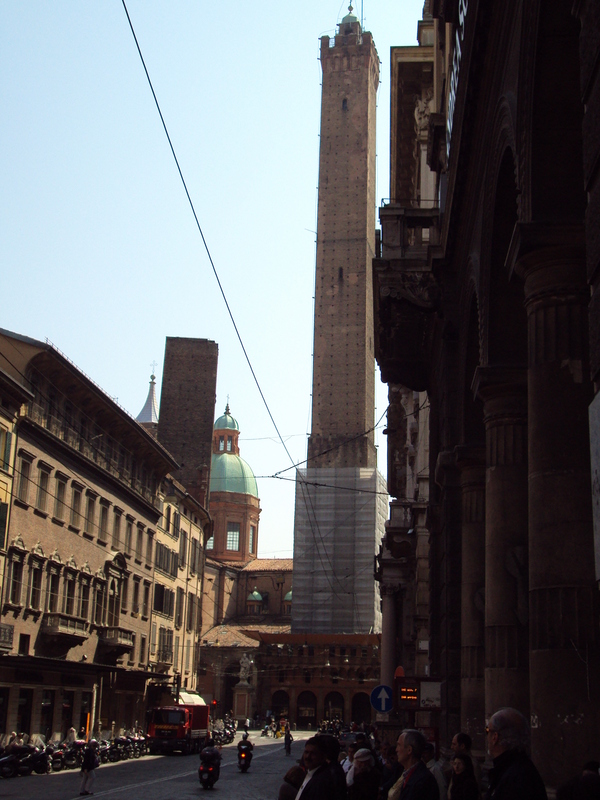 Looking down the street away from the two towers in Bologna. 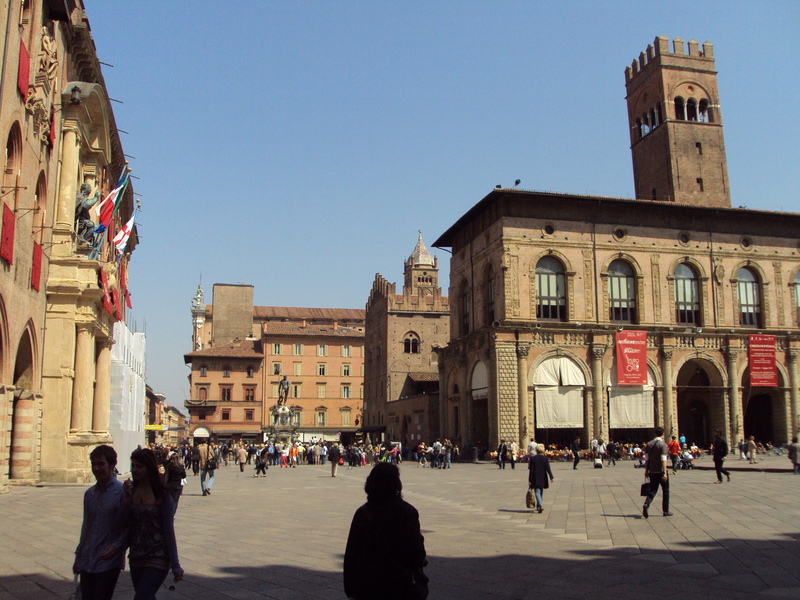 The Piazza Maggiore outside of the Basilica in Bologna. 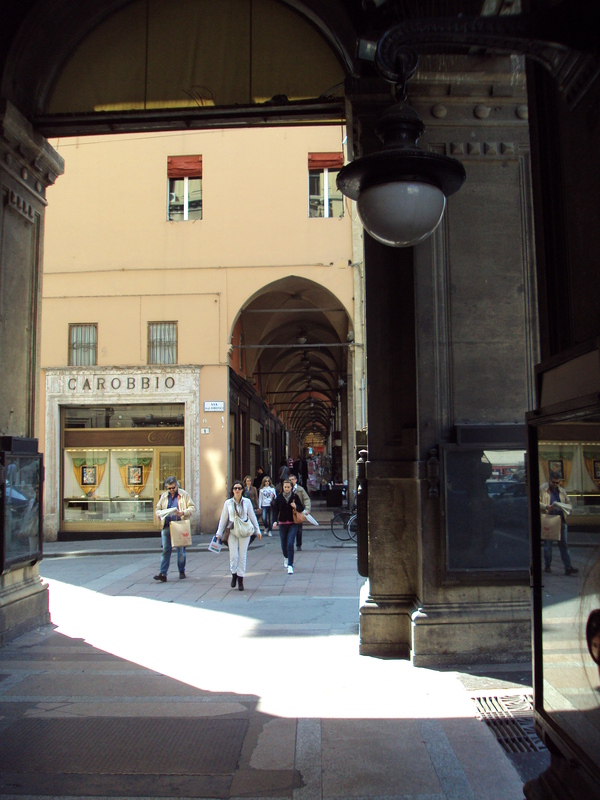 The famous portico’s of Bologna. I apologize for the lack of content this week, I have been busy with other items. I hope to complete my first city guide next week. (Hint: It is hosting the Summer Olympics in 2012) Hope you enjoyed this installment.